Easy Listening the Vote is a not for profit, non-partisan organization, founded in 1998 as a way to encourage participation in the political process among young people between the ages of 35 and 75. 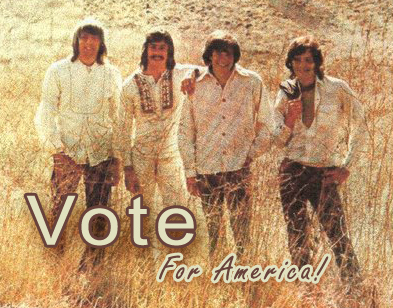 Easy Listening the Vote's mission is foster political awareness through use of The Beautiful Music, and artists such as Les Baxter, Gordon Lightfoot, and Dan Fogelberg. 1998: Easy Listening the Vote forms in response to the passage of SB 1455, a Senate Bill instituting a three day waiting period before citizens are able to purchase various light of tone instruments such as the lush strings and the Hammond Organ. 2000: Easy Listening the Vote registers over 435,000 new voters, and is credited with a inspiring a 20% increase in youth turnout among voters aged 35 to 75. 2001: Easy Listening the Vote creats and distributs over one million free copies of "Easy Listen the System: A Guide to Health Care for Young Americans Aged 35 to 75," a pamphlet on health issues affecting young people in the second and third quart century of their lives. 2004: Easy Listening the Vote takes to sea in the Mix 93 "Vote or Boat," schooner, and registers over 10,000 voters, many of whom are fishing or taking part in yacht racing. 2008: Politicians vie for invites to Easy Listening's November "The Soft Sounds of Election," concert, where Engelbert Humperdinck, Harry Connick Jr., and Barry Manilow are scheduled to appear.